This is a half-assed review because the CD is from 2013. But it deserves to be whole-assed, because that CD is one of the best I’ve heard in a long, long time. 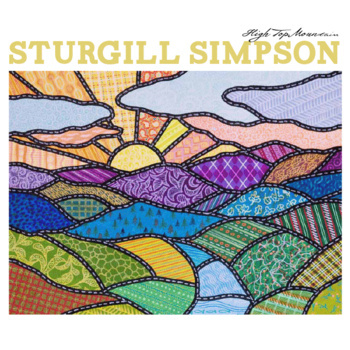 Sturgill Simpson’s High Top Mountain is just about as good as it ever gets. If I had made a list of the best albums of 2013, it would have been #2, behind only Jason Isbell’s Southeastern but beating Brandy Clark, Kacey Musgraves, and even Guy Clark. I bought my copy at a Simpson show in D.C. in November and haven’t looked back since. I’m writing this review so late only to help me prep for my next review — Sturgill’s new 2014 release, Metamodern Sounds in Country Music. I’m going to quick hit each track one by one, but skip most overarching notes, other than to say this is a true outlaw record (even if he does sing “the most outlaw thing that I’ve ever done was give a good woman a ring”) – and not like the faux “new outlaws” like Eric Church. When I first heard Sturgill sing and his band play in that bbq joint basement, I said “Holy crap they sound just like Waylon,” and most other critics have said the same. But that’s really an unfair thing to say and I need to stop, because despite the similarities, Sturgill is his own singer and definitely his own writer. He writes great songs, and knows how to sing them with soul. It’s the opening guitar blast of “Life Ain’t Fair and the World is Mean,” it’s the growling on “Sitting Here Without You,” it’s the pacing and chorus lyrics on “Some Days.” The emotional loneliness of heartache we’ve all felt that is captured so perfectly in several of these songs. The fast tempo and steel guitars of “You Can Have the Crown” are enthralling. References to Baghdad and the Internet that keep it fresh and relevant. And everything, just everything about “Water in a Well” and “Time after All.” Am I gushing? I’m gushing. I love this album, especially for a solo debut where the artist wrote all but two of the tracks. Five whiskey bottles out of five – and note that the digital copy is $2 cheaper on Sturgill’s site than on iTunes. It’s independently produced, so buying direct from the artist matters. “High Top Mountain” was produced by Dave Cobb at Falling Rock and Hillbilly Central, both in Nashville, for Sturgill’s own independent label, “High Top Mountain Records.” It features Hall of Fame session musician Hargus “Pig” Robbins (his first major recording was Jones’s “White Lightning”) on piano; Chris Powell on drums; Waylon Jennings guitarist Robby Turner and Leroy Powell on steel guitar, Turner and Brian “Freedom Eagle Bear” Allen on bass, Bobby “Diamond Bob” Emmett on organ and Mellotron, and Cobb on 12-string electric guitar.